Home Exterminating Service, in Dallas, Texas, offers complete and effective services including termite treatments, general pest control, and more. If you're having any kind of pest problem, contact us to get rid of the problem today. Since 1965, Home Exterminating Services, a family-owned-and-operated company, has been dedicated to providing unsurpassed customer satisfaction with our integrity and professionalism. We have a full-time entomologist on staff to handle any pest problem. 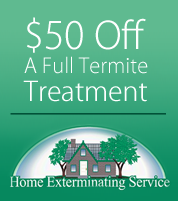 We are termite specialists and we treat every home and business as if it were our own when we provide service. Contact us for more information about our termite treatments and pest control services.